A biography of a girl growing up into womanhood in a harsh environment where she battled to survive against huge obstacles in an insane world is revealed to the world. 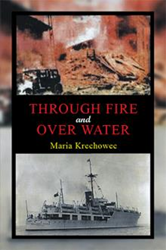 Written as a fulfillment of a promise of a son to his mother, the story accounts a life that survived “Through Fire and Over Water” (published by Xlibris NZ). The author, Alec Krechowec, pays tribute to his mother, Maria Krechowec, in this story that paints a graphic picture of what happens when dictators come to power and impose their wills on society. Translated from a Ukrainian journal to the English language, “Through Fire and Over Water” chronicles the life of Maria growing up in rural Ukraine. She survived Stalin’s man-made famine, the Holodomor. She grew up under an oppressive communist regime. She lived through World War II, taken as slave labour, escaped the labour camp to live amongst German society and experienced the horrors of Allied bombing. To be liberated, she escaped from the eastern sector, lived a life as a displaced person then travelled half way around the world to New Zealand. By sheer determination, courage and fortitude, Maria overcame odds to reach her ultimate goal of having a family and home she could call her own in a distant land. “It is a true life account of what happened to ordinary people caught up in events not of their own making. It has drama and action in situations where a reader may ask, could I survive such an ordeal. It portrays regions, towns and areas most readers have very little knowledge of where they exist,” says Alec. Ultimately, Alec invites the readers to witness a battle for survival against near impossible odds where death walked hand in hand until reaching a safe haven half way around the world to call a new home. To purchase and to know more about the book, interested parties may visit https://www.xlibris.com/Bookstore/BookDetail.aspx?BookId=SKU-001185785. Maria Krechowec born on the 14th April 1921 in the small village of Ivanka on the Ukraine. She experienced many horrors perpetrated by the communist as well as the invasion of the Germans in World War II. She wrote her life story in Ukrainian and her son Alec Krechowec translated this into the English language. Alec Krechowec left school and joined the Royal New Zealand Navy where he served for a short period of time. After coming out of the Navy, he became a radio technician in the telecommunications industry. After 27 years as a technician, he took up a position as an engineer in the power industry designing telecommunication system. At 65, he retired from the work force and concentrated on work at home and traveling abroad, visiting the town of Goslar where he was born. Then at 71, Alec decided to publish his mother Maria Krechowec’s life story. Xlibris Publishing New Zealand, an Author Solutions, LLC imprint, is a self-publishing services provider dedicated to serving the needs of Kiwi authors. By focusing on the needs of creative writers and artists and adopting the latest print-on-demand publishing technology and strategies, we provide expert publishing services with direct and personal access to quality publication in hardcover, trade paperback, custom leather-bound and full-color formats. To date, Xlibris has helped to publish more than 60,000 titles.For more information, visit xlibrispublishing.com.au or call 0800 443 678 to receive a free publishing guide. Follow us @XlibrisNZ on Twitter for the latest news.